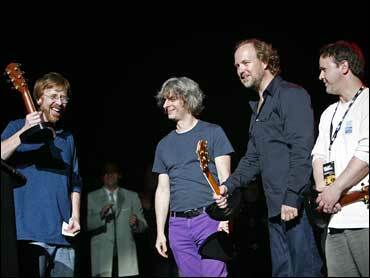 Phish No Longer "Gone Fishing"
Phish is getting back together. The Vermont-bred jam band Phish, which disbanded in 2004, announced Wednesday it's reuniting for three dates next March in Virginia and more after that. Phish has booked dates for March 6-8, 2009, at the Hampton Coliseum. Other 2009 dates will be announced later, according to a notice posted on the band's Web site Wednesday. A spokesman for the Coliseum, who wouldn't give his name, confirmed the booking. Ambrosia Healy, a spokeswoman for the band, didn't immediately return telephone calls seeking comment, but confirmed the dates in a news release. It'll be the band's first concerts since August 2004, when Phish said goodbye to its legions of fans with a two-day festival at Newport State Airport in Coventry, Vt.
Phish was among the nation's top touring acts when it called it quits in 2004. The band received a lifetime achievement award at the Jammy Awards last May. The band got its start at the University of Vermont in 1983, earned a Grateful Dead-style following in the 1980s and 1990s with its amorphous blend of rock, jazz and other styles. It was among the nation's top touring acts when band members called it quits in 2004. Rumors of a reunion have swirled since last May, when all four - Trey Anastasio, Page McConnell, Mike Gordon and Jon Fishman - appeared together to accept a lifetime achievement award at the Jammy Awards in New York. They didn't play that night. Hampton Coliseum holds special meaning for Phish. It has played there a dozen times, and recorded "Hampton Comes Alive," a six-CD set, there in 1998.